Since 1982, the medical community has been a major focus of our outreach efforts. 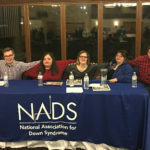 NADS speakers have addressed genetic counselors, obstetricians, pediatricians, nurses, social workers, physical therapists, and many other health professionals. Many of those specialists come into contact with the families before we do, and they see the families at what is often a very difficult time. Our hospital in-service programs address the hard questions medical professionals face in breaking the news: how do they tell the parents? Who should be present? How can they provide families with hope? 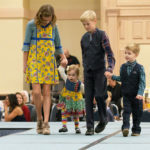 We provide medical professionals with current information about Down syndrome and give them a vision of what it is like for families to raise a child with Down syndrome. To arrange a hospital in-service, please contact NADS. Canadian Down Syndrome Society booklet, "Breastfeeding a Baby with Down Syndrome"
La Leche League booklet, "Breastfeeding a Baby with Down Syndrome"
"The Power of a Doctor's Words"